Macro Musings Blog: Is the UK Secretly Targeting NGDP? This slope of the trend line indicates an average nominal GDP growth rate of 5.3%. It seems plausible, then, that the Bank of England is actually targeting nominal GDP. This is not entirely surprising given there are respected economic commentators in the UK like Martin Wolf and Samuel Brittan that endorse the idea. 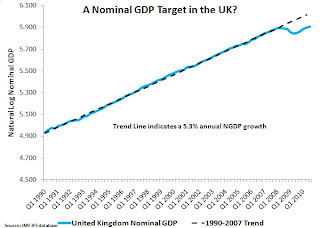 Of course, it would be even better if the Bank of England were targeting the nominal GDP level and thus aimed to close the NGDP gap in the figure above. However, given the grief the Bank of England is getting for its current monetary policies a level target seems unlikely. Here, here, and here are a few of my most posts that explain why I like nominal GDP targeting.